Confession: I have never been speed dating. I just love the idea of it. In 2012 I wrote about an activity we did in my AP English class that got everyone talking as we prepared for the AP exam. I hadn’t even thought about that, until I started to write about our latest foray into the talkative world of speed dating with books. I know many teachers have tried some version of this activity. I want to add my voice to theirs: this is a F.U.N. way to get students talking about what they have read and what they might want to read — both important factors in helping students of all ages develop their identities as readers. 2) find a second book that they thought they might like to read — maybe they liked the cover or the title; maybe they had heard someone talk about this book. Didn’t matter. Then, we tried this “speed dating” thing. First, we formed two circles, one inside the other. One circle faced outward. The other faced inward. Students stood in front of one another, and I with the easy job stood with the timer and the camera. 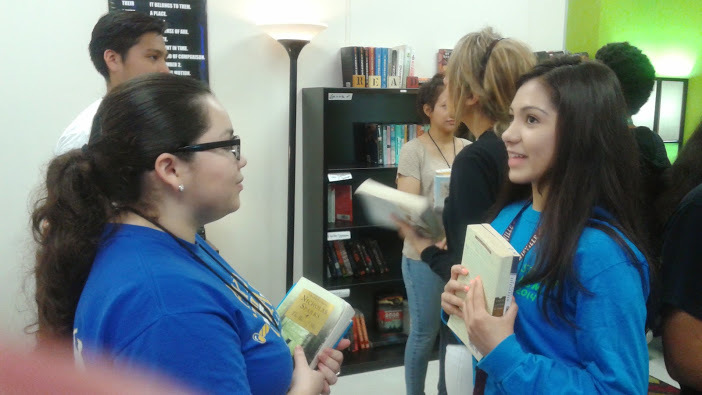 We talked books for as many minutes as it took for every student to talk one-on-one with every other student. It was exhausting. And wonderful. After we completed all our rounds, we set all of the books out on one table, and students picked up their writer’s notebooks and turned to their “What Shall I Read Next?” lists, adding any titles they might want to read during the last two months of school. Every student wrote down at least one book. Some wrote down several. d. know how to find books they like. The moment I stop holding up books at the beginning of class, reading a bit, and encouraging them to give it a try, many they stop reading. I don’t know if my readers will be strong enough to keep reading when they leave me the first week in June. You must read if you are a student in my class. You are a reader who reads every single day. What are some activities you do to keep your babies reading? I may have that made into a poster and placed in my room. I have done the speed dating with AP titles to get my preAP juniors reading above their level and to prepare them for their senior year of AP Lit. The librarian is a huge help because she pulls all the titles in advance. Then when I take my classes to the library, they spend about 5-6 minutes at a table full of books, perusing, evaluating, sampling. Then they switch to the next table, and so it goes for the class period. They are able to preview and choose what they want instead of my assigning a whole-class novel. I’ve done this the last two years, and for the most part, it is really successful. (Of course there are those students who fake-read, but many find titles they never would have discovered on their own.) This speed dating is the intro to what I call “Taste of AP” when we start dabbling in AP Lit prompts, exposing them to the level of work that is required for success the next year. I have so much to learn about continuing to create and strengthen a culture of literacy in my classroom. I love having Book Talks (I think you call them “Book Chats”) with students about their book selections. This morning alone I’ve talked about the Vietnam War, WWII, Body Language, modern mythology and feminism. The coolest part about it is that I can flip over to Book Talks with other students and now start cross-pollinating, making recommendations to students based on what other students have been reading. It’s hard work to create and continue a classroom that values reading. I applaud all of you who roll up your sleeves and hold steadfast to this endeavor. I felt rejuvenated just reading this…I can anticipate the buzz in Room 382. Thanks for reminding us how we can add ‘spice’ to our and our students’ reading lives! Can’t wait to try this! I used to do this with vocabulaty . Each team would divide up the words, look up the meanings and decide how to get that definition across so it could become a part of the standard repetoire of usage for a classmate. Then the sides would switch.